In Runescape, Fishing is an incredibly profitable skill to gain 99 in, and it is one of the better looking capes. 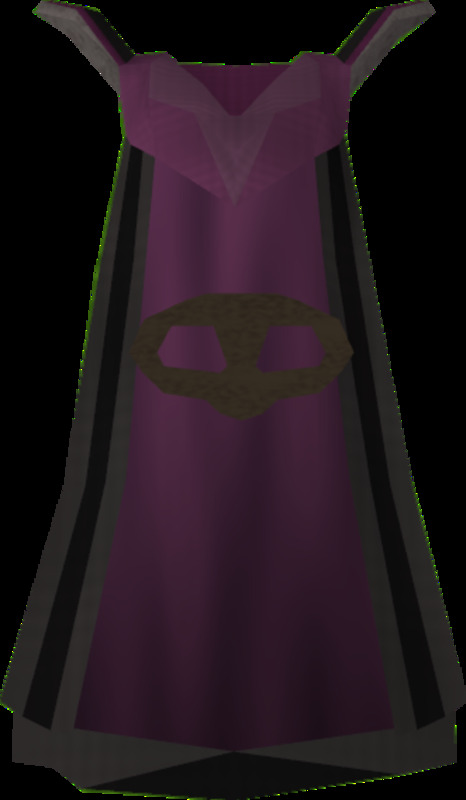 When most people see a fishing cape, it symbolizes wealth. This skill can earn you different amounts of cash, depending on how fast you want to gain 99 in this skill. 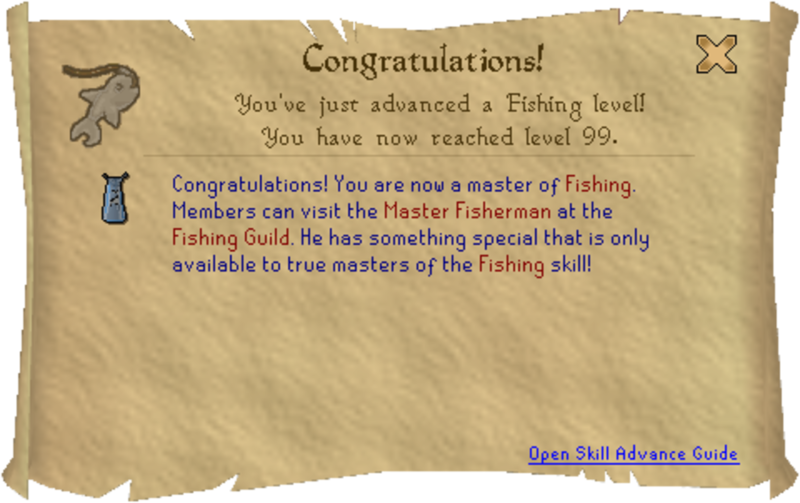 I will be outlining two ways to get 99 fishing. The first will be the quickest way to gain 99 fishing, and the second will be the most profitable way of fishing. I hope you guys enjoy! The place to start for this skill guide is Dranyor Village. From level 1-5 you should start off by fishing in Dranyor village next to all the willow tree’s. Open the Runescape Mini-Map if you are unable to find this. Bring your Small fishing net along in your inventory, and have your fishing rod along with a few hundred bait in your bank since you will stay at this spot for a while. All you have to do is click on the fishing spot, or right click on the bubbling fishing spots and select the “Net” option. If you are having trouble finding these fishing spots, simply go to the bank, look around the water beside the Willow trees, and you should see the bubbling water or other fishers at these spots. Then it is just a matter of waiting for you to get a full inventory of shrimps and banking those shrimp. Sometimes the fishing spots will move locations, so just be aware of that and switch accordingly. Keep repeating this until you get to level 5 in fishing. It will take 39 Shrimp to get to level 5 in fishing. From level 5-15, you should bank your small fishing net, and withdraw your fishing rod along with 100 bait. Simply go back to the same spot’s in Dranyor where you just came from and fish in those exact same fishing spots. These times though you will need to right click on the fishing spots and select the “Bait” option rather than the “Net” option. From level 5-10, you will only be able to catch Sardines in these fishing spots. Once you get to level 10 fishing, you will also catch Herring in these same spots, so your inventory will get full with about half herring and half sardines rather than only sardines. You must simply fish at these spots until you get to level 15 fishing. It will take 101 Sardines to get to level 15 fishing from level 5. Sardines give less experience than Herring however, so you will need less than 101 bait to get to level 15 depending on how many herring you are able to catch. Well for a final time, you will be withdrawing your small fishing net from the bank, and depositing your fishing rod along with all your bait. You will repeat the exact same steps as you did while catching shrimp from level 1-5, the only difference here is that you will be catching Anchovies as well as the shrimp, and therefore there will be two different fish to bank instead of just the one. It will take 204 Shrimp to get to level 20 fishing from level 15. It will take 51 Anchovies to get to level 20 fishing from level 15. Since you will catch a mixture of both Shrimp and Anchovies at a random rate chosen by Runescape, it is impossible to tell how many of each you will catch, but these are the numbers to get to level 20 fishing alone. Combined, you will be receiving less of both types of fish. Well it is finally time to leave Dranyor village! You should deposit your small fishing net and withdraw your fly fishing rod along with 1500 feathers just to be on the safe side. Now there are two options as to where you should be going. If you are F2P (Free-to-play), then you should be going to Barbarian Village fishing area. You will see Barbarian Village south of Edgeville, and the fishing spots are to the east of the village along the river. The second option if you are P2P (Pay-to-play) is to go to Shilo Village. You must have completed the quest “Shilo Village” to gain access to this town however, so if you have not done this quest, you should still go to the Barbarian fishing spots. Again, Use your Runescape mini-map if you are unable to find the proper spot. Once here, right click on the fishing spots and select the “Lure” option. Once your inventory is full you should bank at Edgevillage if you are using the Barbarian fishing spots, or at the Shilo Village bank if you are fishing in shilo village. 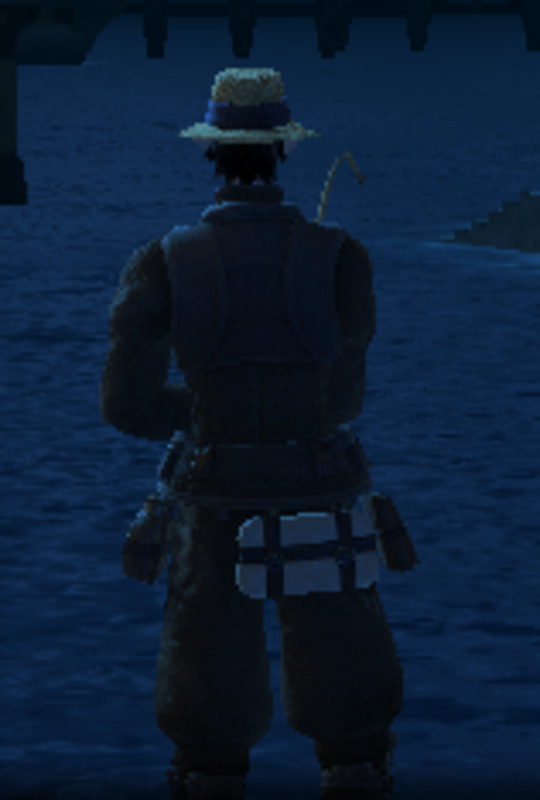 Continue doing this until you are at 48 fishing. It will take 1571 Trout to get to level 48 fishing from level 20. You will need less than 1500 feathers though due to the fact that you will also start catching Salmon once you get to level 30 fishing, and since they give you more experience, you will not need the full 1571 feathers that would be required to get to 48 fishing catching trout only. First Thing I’d like to say here is to bring many feathers if your cooking level is low. 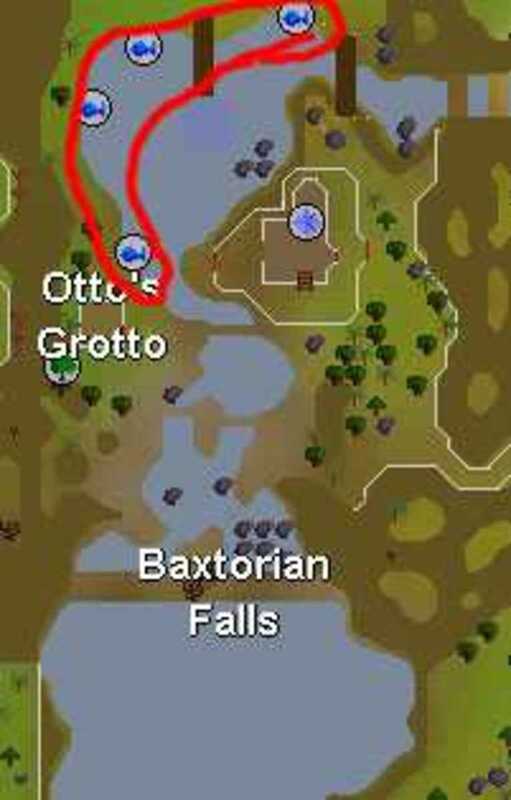 To start Barbarian fishing, you need to go see Otto at Otto’s Grotto which is located south-west of the Barbarian Outpost. You must have 48 fishing (Which you should already), and you must also have at least 15 strength and 15 agility. Go to Otto and talk to him about a new way to fish and he will tell you to take a rod from under his bed. Take this rod from underneath his bed and head north of his house and fish at the fishing spots located around the lake. After you catch 1 fish, you will get a message saying that you should go back and talk to Otto. Go back and talk to Otto quickly and then you will be able to start fishing at these spots normally. This is the only method of fishing that differs majorly from the other methods of fishing. You will need different amounts of feathers depending on your cooking level. If your cooking level is 70+, then you will only need 25 feathers. If your fishing level is any lower than this, you should bring as many feathers as possible depending on how much lower your level is. Your inventory should have your Barbarian Rod, Feathers and a Knife in it only. Once you catch a full inventory of fish, you need to use your knife on the fish to begin cutting them. You will gain 5 cooking experience for each fish that you cut. When you cut a fish, you will have a have a chance at receiving Fish offcuts along with either Roe or Caviar. The higher your cooking level, the higher your chances of succeeding at cutting the fish. The fish offcut’s will be used the same way as feathers once you are completely out of feathers. The Roe and Caviar will be replaced with a fish which differs slightly since these are not stackable. So depending on your cooking level, you will have to choose which option you do. At a lower cooking level, I usually cut the fish and then drop any Roe or Caviar that I received since the Feathers take priority over them and keep the fish offcuts to use later on. At a higher cooking level, I simply take 25 feathers and once I have caught 25 fish I cut them all and then begin fishing once again. The Roe and Caviar will take priority over the offcuts while fishing, so once you have used all of your Roe/Caviar then your offcuts will slowly start to be used up. Once your inventory is full of fish again, drop your remaining offcuts and repeat the cutting process. Simply keep repeating these steps as you go. You will have to find your own method depending on your cooking level, so just try a mixture of these two until you find something that works for your level. It will take 259029 Leaping Trout to get from level 48-99. It will take 184992 Leaping Salmon to get to level 99. It will take 161868 Leaping Sturgeon to get to level 99. You will be getting a mixture of all three of these fish, so it will take you somewhere near 180,000 fish to get from level 48-99. This is the fastest experience for fishing in the game, but it is the hardest to keep up, and therefore is not preferred by most people. You also break even or sometimes lose a bit of cash, so people usually prefer to choose Method 2 which is the money making method. I know this is very confusing when first hearing about it, but in Simpler terms, you will simply be catching fish with feathers, cutting them using your knife, and then using the new items you received from cutting these fish to use as bait in order to catch other fish. The second method of getting to 99 is to simply continue fishing Trout/Salmon at Barbarian Village or Shilo village. This is only slightly slower, and it will give you a slight profit which is better than nothing. Well to get to level 62 fishing, follow the guide that is above since this is the fastest way to get to 62 which is ultimately what you want. To shorten this guide a little bit, I won’t repost everything down here, and you can simply follow method 1 to get to level 62. In order to begin fishing Monkfish, you will have to complete the quest “Swan Song” which will give you access to the town of Pictoris which is where you are able to fish for Monkfish. In order to fish these, you will go to the town of Pictoris which is very far from any bank. The best way to get there is to either use a Spirit Kyatt to teleport you, or to teleport to Gnome Stronghold and then exit and run North-West along the outer gate. Once you are there, head to the water closest to the bank and choose the “Net” option in the fishing spots. You need no bait to do this, which is good because you need absolutely no cash to start up. Monkfish are caught faster than lobsters usually, and they provide and extra 30 exp along with being much more expensive than lobsters. Some people like fishing lobsters, but the truth is you will gain more experience and cash by fishing monkfish to 99. Fishing sharks is not a good way to gain cash usually since Monkfish can catch much faster than a load of sharks, and therefore the amount of monks you can catch in the time it takes to get 1 load of sharks makes the profits around the same with much more fishing experience coming from the Monkfish. There really isn’t a lot to say here. You just have to keep fishing monkfish, and catch away until you get to 99 fishing! You will need approx. 105712 Monkfish to go from level 62-99, and at an average price of 500ea, you will be looking at over 50m in cash after getting your 99. Well there is a lot to tell for fishing which is why this guide has been a little bit longer than my first. There are many different options on how you should be fishing, but the right one for you depends on whether you want to get 99 as fast as possible, or whether you want to gain 99 with a ton of cash in your bank. Once you have caught all the fish and gained 99 fishing, you can get your fishing cape from the “Master Fisher” who is directly outside of the fishing guild. The Final Tip I would like to tell any fishers out there is to Merchant while you fish. Since you are not using any items while you fish, it is very beneficial to merchant with your extra cash in order to gain more wealth while you fish. It is also a great idea to watch the Grand Exchange markets, and when the price of Monkfish is starting to get higher than usual, then you should go and sell at that time in order to maximize your profits from the fish that you are catching. Runescape - Best High Level AFK/Money Making Thieving Training! what do u do with the fish after u bank them? im currently fishing at barbarian village because it has a fire so i can fishing pike then cook it then give it to a noob. how far is the nearest banking spot from the place n which you wish monkfish. just use the rsbot.org it is truly easy like no joke, and it isn't a scam. please believe me. wheres the best place for me to catch monkfish??? I have 65 fishing where should i fish and how long would it take for 99? Yea the deposit box may be quicker, but dropping the fish is the quickest way. It just depends on if you care about the little amount of cooking EXP or not. And also it depends on if you have enough feathers or not. what is the number that is at the end of your website title and the number at the end of your name?